Personality & Temperament: Lenneth is a quiet soul. Often her silence is mistaken for the absence of thought, but this is not so. Lenneth considers herself a soldier in the command of her contractor. She is loyal to her summoner without hesitance or condition, for good or ill. As a being of the old world, a valkyrja - "Chooser of the slain" - Lenneth remains unchanged by the passage of time. The virtues which guided her kind in working the will of the norse father god, Odin, remain ablaze in her breast; Honor, Courage, Perseverance. A full-bodied polearm with flaming barbs a spear tip that never cools, Draugarsbane is permanently enhanced with a fire-aligned magic effect that cannot be dispelled or negated. 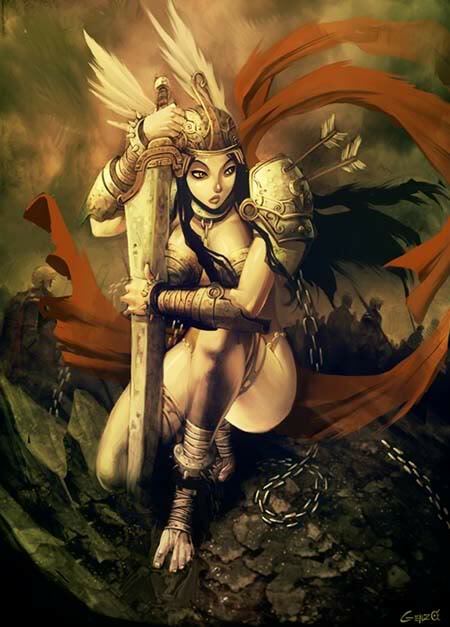 Lenneth's spear is a weapon she must call forth from the realms of Valhalla, and is not always at her side. - Effect: A host of phantom heroes lend their might to rebuke the enemies of the valkyrja! Non-corporeal soldiers ( an estimated total of 3-10 ) wield shadowy blades that cut as deep as any steel. Their strike is a concerted effort that dissipates after one rush, but may be re-invoked at any time. Their loyalty is to the valkyrie, and should a blow be leveled against her while they are active the phantom host will shield her. After absorbing such a force the shades dissipate until called forth once more. Often times Lenneth will draw the shades to her when she is summoned even for non-combat situations. Their presence seems to calm her. - Range: Evoking the fallen souls to her side in battle requires the target be within Lenneth's line of sight. - Effect: Lenneth's companion, the celestial warhorse, Eindride, is called forth to her aid. Eindride is gifted with wingless flight, an innate ability said to be possessed by all the stallions of the valkyrja. Eindride may carry both Lenneth and her contracted summoner, though he will allow no other soul to mount him (even at the request of Lenneth or her summoner). Eindride may remain active so long as Lenneth is within the human world. - Effect: Once Lenneth has sustained injury she may invoke the calamity of a meteor storm to bolster her strength! Her destructive output is magnified to inhuman levels ( in example, Lenneth would be able to put a hole through a boulder with her goddamn fist ) and a fire elemental affinity is applied to all melee abilities. The added elemental effect is great enough to penetrate any wind-aligned shielding types. This buff remains active once put in effect so long as the summon is conscious/ active in the human world.